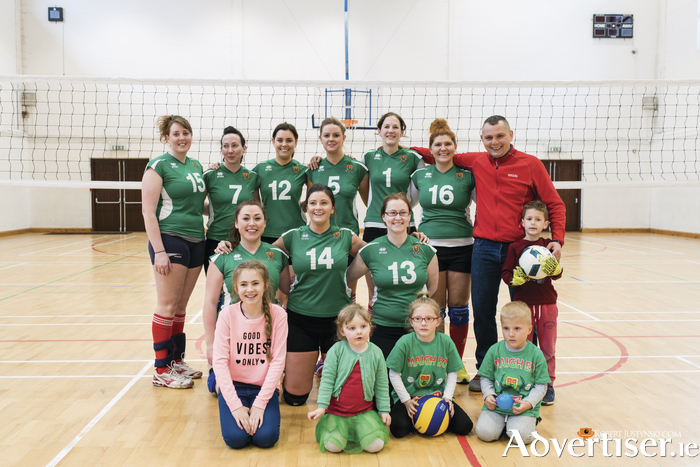 The victorious Mayo volleyball team: Back row: Edel Nolan, Carmel Forde, Eimar McNieve, Grainne McNieve, Mikal O'Boyle, Paulina Balik Nowak, Alex Poplonski (coach). Front row: Jackie Prendergast, Louise Daly, Gillian Doherty. Photo: Robert Justynski. Mayo Volleyball Club today finished their maiden season with a clean sweep of victories to claim the national division two title. Their 14th and final game resulted in a 3-0 win against Aer Lingus - completing a fine season devoid of blemish. The home side were in buoyant form from the start as they unleashed a ruthless assault on the Dublin based side. Once Paulina Balik Nowak won service she maintained possession for 17 straight serves building a commanding lead to eventually win the opening set 25-8. In the second set complacency set in and the Western outfit conceded many points early on. Some quick and precise hitting from Grainne McNeive brought Mayo back into contention and once the home side took the lead they never looked back. Mayo closed the set out taking the spoils 25-18. The third set started with more vigour from the away team as the sides drew level seven times. However Mayo won back their rhythm and when it counted they remained resolute in the latter stage of the set to see it out 25-22 and the match 3-0. Mayo finished a whirlwind first year of volleyball winning all 14 games and will enjoy the prospect of playing in the top division in the country next season. After the game Mikal O'Boyle said, "It's great to wrap up the season with no losses. It just shows how well the team gels especially considering the club was only formed officially seven months ago. Positive attitude is a great attribute of ours and the commitment of the players is unquestionable. We are all looking forward to the challenge of playing in the division one next season." Mayo Volleyball club will be hosting a pub quiz in the Dalton Inn Claremorris on Friday, April 21 at 8pm. This will act as both a celebration and fundraiser for the club. All are welcome and they would appreciate your support. There will be some good prizes to be won. A team of four costs €40. For more information check out Mayo Volleyball Club on Facebook. Mayo: Louise Daly, Paulina Balik Nowak, Carmel Forde, Edel Nolan, Mikal O'Boyle, Gillian Doherty, Jackie Prendergast, Eimear McNeive, Grainne McNieve. Coach: Alex Poplinski.